This past weekend I went to San Francisco with Cely. How come no one told me it would be that cold? I went there with dresses and one pair of cut-off jeans. Suffice it to say, I went shopping for some real clothes the next day! I went for a coworkers wedding and like the only duh duhduh I flew into San Jose. The trip into San Fran was long, but scenic, so I can’t even complain about that. My flight was at 6:15 AM. I didn’t even bother sleeping the night before, as I didn’t have a ride. I took the LIRR to the Airtrain and made with an hour to spare. Cely and I had an hour layover in Phoenix which wasn’t bad (we ate lunch). Once in San Jose, we took a shuttle into Santa Clara and then the Caltrain into San Francisco. In total it cost about $10, opposed to the hundred something I thought I would have to pay. I wish I could tell you what the scenery looked like, but I can’t…as I was sleeping. On Sunday was my coworkers wedding, and I must say, she looked beautiful! Absolutely stunning! Her friends are awesome too, and we all had a great time together. It was a great weekend! I also got to see the Golden Gate Bridge aka the Red Bridge. 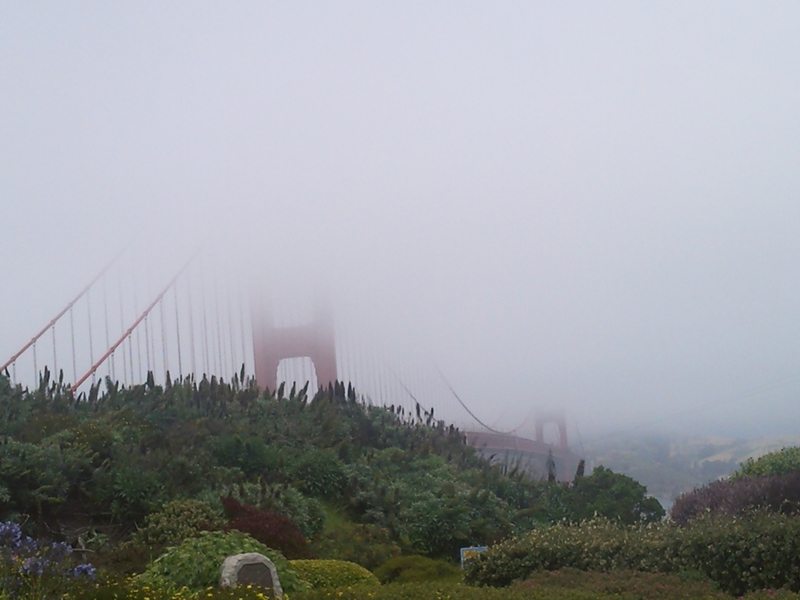 Well, bits and pieces of it anyway…it was foggy as hell up there.